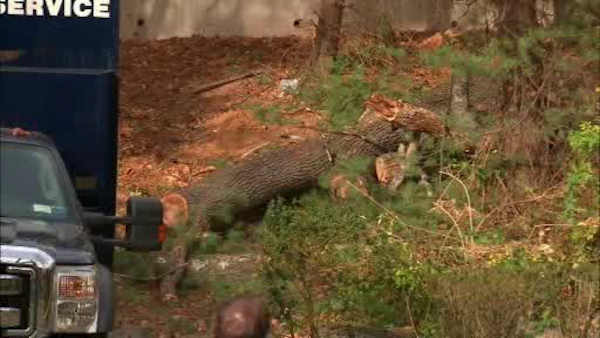 RAMSEY, New Jersey (WABC) -- A tree service worker was rushed to the hospital, where he was pronounced dead, after being struck by a tree Wednesday in Ramsey, New Jersey. It happened at about 3 p.m., at the Peach Hill Townhouses, where part of the tree came down and struck the worker. A witness said EMTs worked on the victim for about 20 minutes, and he was then rushed to Good Samaritan Hospital in Suffern. The worker was not identified, but was said to be a 30-year-old husband and father of two from New City. The Bergen County Sheriff's Bureau of Criminal Investigation and representatives of the Occupational Safety and Health Administration responded to the scene. The matter continues to be investigated.